We know the names... What do they do??? In CoH terms:Commander is Control/*, Enforcer is Melee/*, Guardian is Support/*, Operator is Pets/*, Ranger is Ranged/*, Stalwart is Defense/*. The Specifications within the Classifications give a different secondary. 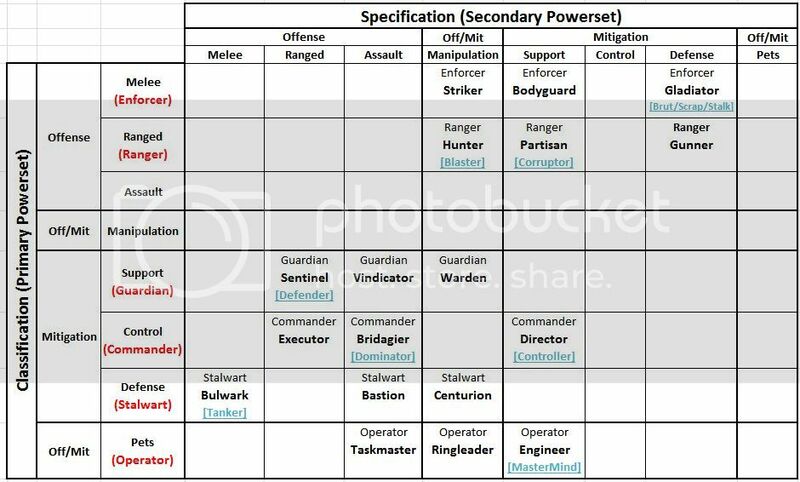 It would be a mess to list them all without formatting, but for the Stalwart, The Bastion gets */Assault, the Bulwark gets */Melee, and the Centurion gets */Manipulation. There are also 3 Foci per Classification, which grant a central passive ability like Brute Rage, Stalker Sneak Attacks, Or Tanker Punch-voke. The basic idea is simple enough to explain though. The MadGent listed the base classes, of which there are six. Imagine if you could choose one of three different kinds of secondary power sets for your tank, melee, ranged, or control. Or for your Blaster, melee, control, or defense. That's all it is - the classic classes with the ability to choose the category of your secondary. Obviously this has much awesomeness in it, but it is pretty simple really. Is there a "finalized" or at list well compiled list of the powers & which archetype we will get to chose from in the beginning? 1 eye > ... No, not yet. Way too early to talk about 'finalized lists.' The plan is to have a system flexible enough to re-create the old CoH ATs in a similar look-and-feel, but not slavishly copy. And the extra flexibility will allow us to surpass CoH's customization of powers. Give me access to power armor and a big hammer, and we'll be off to a good start! =) Brute was by and far my favorite archetype, though I never managed to get the right "feel" for power armor. Always came off not-quite-right. If Brute Force doesn't work, you aren't using enough of it! Yeah - the sheer variability of the old CoH classes/archtypes and the different combos of powers they could incorporate was one of the big things that kept the game fresh and kept me playing it for years. This set up looks like it'll have even MORE variability and customization - I'm thinking up possible new characters already (of course we know nothing about the specific power sets yet, but we are familiar with the function of each). Lot's being done in that regard Savage. We were, at one time, being promised a nice detailed post explaining the current planning for Boosts and how power sets would work. Obviously they are all too busy now, so we'll see. But the Boosts will be WAY more flexible, this has been promised frequently. CoH was not originally designed for customizing powers. Ours will be, and the possibilities will be far larger as a result. It'll be designed from the bottom up (and casual friendly is one of the most frequently referred to by-words of the game's design goals, so no fears there either). Powers also. Bit hard to explain, but...well, first off, animations and powers are separate. This means powers themselves can be categorized differently. You'll actually pick your power set in two parts. Base (just a placeholder term) and theme. For example, you might pick Blades for a source, Fire for a theme, and Polearm for the animation. You see how this works. Both base and theme will have their own quirks that merge to make every combination different. The details of making sure this results in distinct playstyles is partly buried in what we don't know, and probably partly to be determined via playtesting. To make Super Strength, for a further example, you'd pick Brawl for a base, and Physical for a theme. Or something along those lines. Don't get attached to any more than the basic ideas I'm describing, it's early days and a more thorough explanation hasn't gotten through to us yet. I would note, this is how we're designing the sets, not how they will be presented to the end user necessarily. So we might be presented with a looong list of all the possibilities of combining the first two (relatively easy on your end, looks hella impressive on ours), and then choose our animation? Just for example./.../ Still it's good for the forumites - especially the new ones - to understand the underlying process. i love the splitting up of the main archetypes, impressive idea. I was very impressed myself when it first came out. A very effective way to create a lot more variety while keeping things under control. It's as close to the benefits of free form archetypes as we can get without actually having them or starting to have their problems, IMO. A very elegant progression of the old system. We need those placeholder terms so that we're all on the same page for discussions. I think we all realize that most of what it said here is subject to change. The old forums had a thread with all the new names for archetypes. There's a lot of info that needs to be brought over, it'll probably start coming in after the KS launches. I never did memorize them, hehe. I'm around this evening doling out tidbits of info. What has been brought up is mostly accurate. Currently we have a listing of Classifications each with a subset of at least 3 Specializations. Not all will e available at launch unless we are wildly successful with our kick starter. Each classification can choose from one of three Masteries, these are previously known as Foci in our old terminology and are similar to CoH inherent powers, except now you get to choose from one of three. So even if someone has the same class and spec their character might play a little differently than yours based on your Mastery. There will be more customization as Shadoe Elusive alluded to, as Dr. Tyche pointed out, how it appears to the user will most likely be different. Our goal is a more flexible system by which players will be capable of more diverse character builds and greater ability to design character concepts. Is it too early to say if a character creation tool will be available to play around with prior to game launch. Giving us a chance to play around with the mechanics of the creator would be great in seeing how things flesh out. I know I have been meaning to ask this question and it is possible I already did. If so, I apologize for the repeat. Yes one of our hopes / goals is to release the character creator before launch. No word on character names being a guarantee for the server, but at least you'll be able to design the look of your character. The Masteries are very much up in the air. We do not yet know if there will be three distinct, or if it will be a growing system like branches of a tree. I like the way this is sounding. As you can possibly guess from my forum name, I heavily favor electric-themed powers in games (my first-ever CoH character was an Elec/Elec Blaster, my first-to-50 namesake Brute was Elec/Invuln, my first Dominator to 50 was Grav/Elec, and even my second character ever was a Bots/Storm MM - all four had Ionic Judgment), so the ability to give potentially any powerset an electric "theme" is exciting. ... this is the first game I've been excited about since CoH closed. The main focus of the character creator / avatar builder, for the first "releases" of it, are focused on the costume building and similar aspects. Basically, what most folks would think of as the "tailor" / costuming part of character generation. At what point this is "officially" released depends a lot on just what we nail down for costume support, which is currently mostly-decided-but-pending (basically, there are some fairly crucial answers that we can't pin down without knowing more about what exactly "full access" makes available to us, engine-wise; there is at least one major potential route that is only available that way). The more you guys reveal.. Seriously.. I'm LOVING the idea of different inherent within a class! I hope that there will be a Peacebringer-type utility archetype. I liked Amerikatt being a Jill-Of-All-Trades and then being able to stock-up on Healing IOs so she could be back-up for the main Healer. Are Incarnate-level powers part of the "5-Year-Plan" or is it too early to even consider such a system? I don't mean necessarily having the technical specs figured out, just asking if an Incarnate-type system has even been bandied about. I agree, Amerikatt, Peacebringers were my favorite. Mine was 'human'-form, but had so much flexibility! I have to agree with the Amerikatt and Fireheart. I know there won't be "Peacebringers", but something similar down the line would be great. My human only PB was by far the most fun to play, for me anyway and the one I miss the most. Will there be a gun fu assault power set? Also is there an operator subclass with an assault secondary? oh and I almost forgot, will there ever be an archetype with assault for a primary in the future, if not with release? Note that this is an early schema. No promises. Not all may be available at launch. Schema may be scrapped at any time and replaced by a tuna fish sandwich paper wrapper. Thank you SO MUCH! :D This makes a lot of sense. Zombie, just for that, I won't smash your skull into the pavement.. for now. Ok, so basic math gives us 64 potential combinations in here, but some of those would simply not work (Like Support/Support or Support/Defense), so if we remove all those without any offense capability, the new result is 60 (since control deals damage, if only a little). Aww, you sound just like my summoned Lich, 'Lurch'. In one sense, much less, but maybe more. It is unlikely that Assault or Manipulation would ever be a Primary, and unlikely Pets would ever be a secondary. Nor is it likely you'll have an Offense/Offense character or a Mitigation/Mitgation one (with the exception of the analog for the Controller... which had issues because it was Mitigation/Mitigation). So, that only leaves about half a dozen possible new ones... if there is the time and prioritization for such. So, will people be bored of the 18? Not likely. We're talking about ways to further customize the 18 ATs. One schema is to have three 'masteries' for each one, a sort of third powerset, or a way to choose 'the inherents.' So, just like Brute and Scrapper were both Melee/Defense, but played differently because of their inherents; so, too, will a mastery color the experience of that AT. Are you going to have origins, like mutant, science or magic? There are no origin mechanics planned at this time. Your origin story shouldn't have to fall into a neat category. Besides, personally, I never understood the differences between science and tech. I always thought science was like accidents in labs and such, and tech was using gadgets or power armor. I "accidentally" injected this unlabeled sciencey stuff in my veins, now I pick things up, and put them down, on bad people. I'm curious as to what Assault and Manipulation (as opposed to Control) actually mean from a mechanical standpoint, but I was never really sure what differentiated Assault from Ranged Damage in CoH, either. I am not a clever man. Assault was usually a mix of short/midrange blasts and a couple hard hitting melee attacks. It also usually had a damage aura and some sort of Utility power. I believe manipulation is the same idea as the CoH blaster secondaries, most of which were named "XXXXXX Manipulation". They were typically a mix of some offense, some self-buff, and a bit of control. If I disagree with you, rest assured, it's almost certainly not personal. I probably just want to make sure that your idea is rock-solid. Remember, most of the people in here want the same thing in the end; a game we'll all be proud to call Home. From what devs have said in the past, it will be a mix of offense, control, and support. From what I've gathered, they'll be edited slightly by primary to avoid too much overlap. e.g., taking out the melee powers in Melee/Manipulation, replacing them with something else (Defense?). The stalker /ninjitsu set has been posited as a rough example of a manipulation set for melee. I can also see a batman-style utility belt. I like the ideas here. I recall really wanting, for example, more melee/assault-ish sets for defender secondaries and corruptor primaries (particularly after the Time set came out). Which class is going to get the tuna fish sandwich paper wrapper power set? Just kidding, thanks for the chart! Is there a possibility of a naming system like CO where only our handle needs to be unique? I hate the name reservation game and really liked being able to name a character whatever I wanted. So far that naming convention is the plan, Titan. That's great news and thanks for the fast reply! Might be a good idea to pin that chart at the top level of the AT forums. My favorite was my WarShade. My favorite was my WarShade. I loved the flexibility, a little control, a TON of DPS and tanked more TFs than I can count. I definitely hope they work something along those lines into Titans. Will any of these be able to do the "gun and sword" trick that's pretty common in comics, but never quite made it into CoH? Gameplay Design, plus pitching in here and there on Art, Lore, Composition, Hijinx, etc. Gun and sword? ...we'll see. Gun and sowrd? Pish posh! I want to see sun and gourd! "Gun and sword" might make a good Assault set, actually. Question: Since CoT won't have Inherent abilities baked directly into the classes (like CoH did), in practical terms, what are the major differences between, say, a Gladiator (Melee/Defense) and a Bulwark (Defense/Melee), or a Hunter (Blast/Support) and a Sentinel (Support/Blast)? Will the Primary and Secondary sets level at different rates? Will a set be less powerful if selected as a Secondary? Will the player's base stats and/or multipliers (however they'll work) be different for different Primaries? Will there be different Inherent choices available for each overarching archetype (so a Gladiator and a Bulwark wouldn't have the same Inherents available to them)? Or are you still hashing details like that out? - I can see it as a variation of a dominator's assault set such as an all-out dual wield/dual pistols assault combo (...might make one feel compelled to forget that they have some control powers...). How to get this theme to translate effectively over to other AT's is the question...clearly it will have to be an assault hybrid...a Bastion (Defense/Assault with Brute Inherent) would be a nasty combo, though a Tanker Inherent with Super Reflexes would really make the AT feel 'gun-fuish'. - The first example would seem more like 'Rambo' (...Willpower, of course, though he'd be more Battle Ax (Hatchet)/Assault Rifle kinda guy...). Might need an entire subcategory to the power set so individuals can determine their melee/ranged preferences like the aforementioned Super Reflexes Bastion w/ Dual Pistols/Martial Arts for the John Woo fan in all of us. Great question. I had thought about starting a topic on this. I'm particularly interested in Guardians (Defenders) . I loved the idea of defenders. The first character I made was a defender, but they were eclipsed in many way by other ATs. I don't want that to happen again here, especially when support appears as a secondary choice for several in the early design doc Zombie Man posted. I doubt there are set in stone answers yet, but it is a fascinating topic. Have we hashed it out yet? I guess I don't know what "gun and sword" means. Are we talking about a bayonet? Or some 15th-Century setup where you have a one-shot pistol that takes a minute to reload, so you carry a sword as well? If I had to take a guess I would say that characters like Deadpool and Deathstroke are gun and sword types. I think that the combo would make a cool Assault set. I see what the others are getting at now, there is no Assault primary like the other two damage primaries. I propose the addition of another Classification with an Assault primary, the Professional. The specializations could be something like the Mercenary (Manipulation), the Commando (Support), and the Soldier (Defense). - There's a series of potential range/melee assault combos that would go well together. Archery would go well with any medieval type character...broadsword or dual blades for those wanting to emulate ranger types, katana for those are striving for a more feudal japan persona like a samurai. Assault/beam rifle gets a little more difficult as not much really synergizes well unless you go for the obnoxious like battle axe or war mace. Dual pistols has some givens...like dual blades or even martial arts. I see dual pistols being the favorite Weaponry Assault selection because of how popular Deadpool and Deathstroke are. There are two types of manipulation we want to create; Offensive Manipulation and Defensive Manipulation. Offensive is what you described (mostly), while Defensive will be a mixture of self mitigation, controls and / or debuffs (think Ninjitsu from Stalkers). I think I have an idea we could use for making a tertiary power. What if at lvl 5 you could pick another powerset, but this powerset would have only 5 powers, but would give you powers from another powerset, enough for you to throw in some ranged powers onto your gladiator or some control powers on your gunner, that way we could further customize our characters in ways such as giving your super man like gladiator optic blasts, or giving your dual pistols / super reflexes gunner some martial arts powers so that he can be a master of gun fu. notears, the core concept has been part of the plan although we aren't there yet design wise so things may change. Enforcer will have assassin sub class??? From things mentioned in other threads, don't expect a stalker, think more along the night widow and Bane-spider specs. The chart looks good and it keeps with spirit of COX by allowing players to recreate and possibly import previous toons.